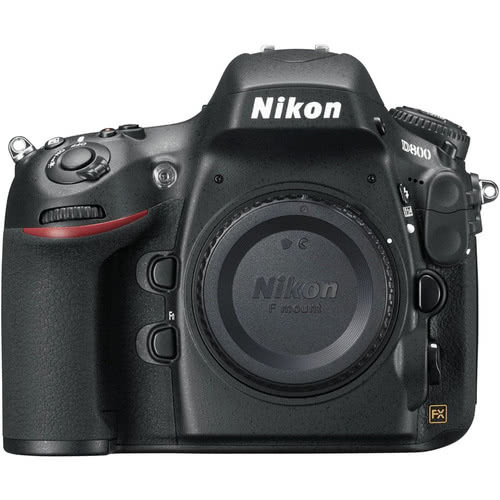 Nikon D800 Digital SLR Camera produces large megapixel files up to 7360 x 4912, which is great for print work, commercial assignments, and portraits. It captures images and video in both FX (full frame) and DX (1.5x crop) format, giving extra versatility to how you use the sensor for your particular shooting need. DX mode for photography gives your lens a little extra reach and allows you to use DX format lenses, such as the Nikon 17-55mm f/2.8G AF-S DX. DX mode for video uses an image area similar to 35mm movie film. The D800 shoots broadcast quality video in two D-Movie formats at 1080/30p full HD. Stay out in the field and shoot for longer with the optional Nikon MB-D12 Battery Grip, which also provides a second grip point with easier button access. This DSLR sports the traditional optical low pass filter, which prevents the instance of moire patterns from showing up in your images of tight-patterned objects, such as fabrics, making this DSLR suitable for fashion and product shoots. Some shooters find benefit in the crispness that can be achieved when these anti-aliasing properties are removed from the camera and for that you can rent either the Nikon D800E or the Nikon D810, both of which do not have optical low pass filters. Take advantage of Nikon's native Creative Lighting System by firing off-camera flashes, such as the Nikon SB-910 Speedlight , with your built-in flash and control external flash power directly from the camera's menu. The D800's Live View function is useful when shooting in a studio setting, especially when access to an external monitor is not available. The screen is 3.2" larger with 170º viewing angle along with 100% frame coverage. This camera is ideal for studio shooting, lifestyle shooting, portraits, commercial work, landscape, time lapse, and videography. • Full frame and crop frame format F mount lenses are compatible with this camera when using the appropriate crop mode.